Home News	Can You Finally Game on a MacBook? Maybe the Core X! Can You Finally Game on a MacBook? Maybe the Core X! Just about two years ago Razer announced the Razer Blade Stealth a great ultrabook with one glaring omission, at least for a Razer: It didn’t have an external video card, just integrated graphics. Which meant you could game on it, but you couldn’t game on it. 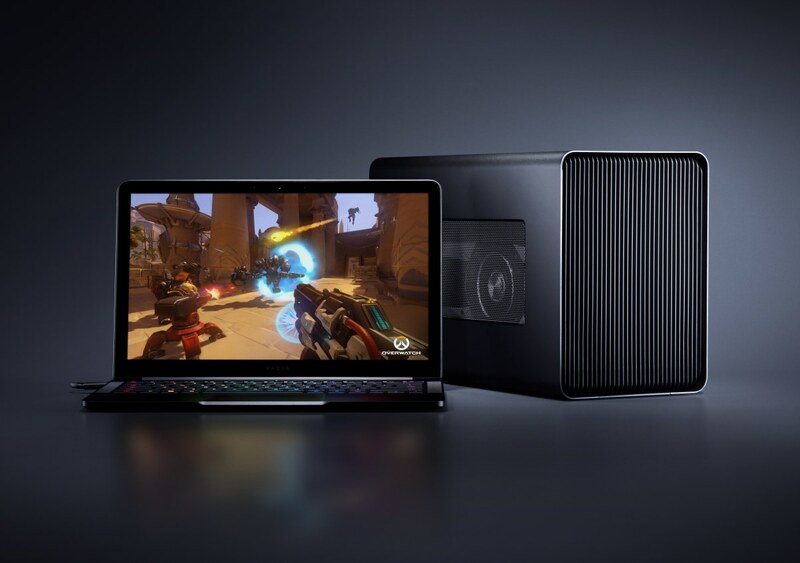 Alongside it, Razer announced the Razer Core, which was basically a case for an external desktop GPU which would go hand in hand with the Blade Stealth. It would connect via USB C, and charge the laptop while it was plugged in. It wasn’t exactly compatible with all USB C laptops, MacBooks included. Plus, it was a tad on the expensive side ($499), especially considering you would have to still buy an actual graphics card if you didn’t already have one. Fast forward to the announcement of the Razer Core X (and Core V2). This one still connects via USB C but is compatible with Thunderbolt 3. That means if you have a Thunderbolt 3 compatible MacBook you should be able to connect right up. The case is a little wide so it will take up a bit of desk space, but that’s a good thing. The reason it’s so wide is to accommodate up to a 3-slot wide graphics card. It is compatible with just about every Nvidia or AMD PCIe graphics card you can buy. The inside has a 650w ATX power supply which is pretty hefty and should future-proof this box a bit. 100w of that power supply will go to power your laptop, so you shouldn’t have any problems staying juiced up while throwin’ down on some Fortnite or PUBG. I think it can even run Crysis. You knew there had to be one right? If you are running MacOS you have to be on High Sierra 10.13.4 or later, Windows machines need to be on Windows 10 Redstone 1 (1607) or later. That’s not really the catch for Mac users though. If you buy the Core X you will need to use a compatible AMD Radeon Card. This is a limitation of MacOS, not the Core X. If you happen to be running Windows 10, you should be fine with AMD or Nvidia. This is where the catch becomes a bit of an easier pill to swallow. While the Core V2 is still priced at $499, you will be able to pick up the Core X for $299! Even better, if you live in the United States, Canada, United Kingdom, France, Germany, or China you can order the Core X right after you get done reading this article. How much are you going to finally enjoy gaming on your shiny new MacBook Pro? Let us know your excitement in the comments!